Mattresses Newington: Are You Allergic to Your Mattress? For those plagued by stuffy noses, sore throats, itchy eyes and other symptoms of allergies but only seem to suffer at night, answers to their biggest questions about nighttime allergies couldn’t come quickly enough. Where many are ready to blame common daytime allergens, there are a variety of environmental elements that lie in wait within your pillow and mattress, causing you to suffer from a variety of symptoms that are likely to cause you to lose precious sleep. Saying that you are allergic to your mattress is mis-leading however. It’s not the materials used in the building of your mattress that is likely to be causing your issues but rather a build-up of dust, dander and daytime allergens. Dust mites are present in every piece of soft furniture you own, however, nowhere are they in such close contact with you then while you are sleeping. Your pillow and mattress are breeding grounds for dust mites and as their populations grow, your allergic reactions to them are sure to worsen. Symptoms of a dust mite allergy include hay fever, itching, rashes, asthma, rhinitis, eczema and even depression. If you allow your pets to sleep in your bed, you’re leaving yourself vulnerable to the allergens that they bring with them. Even those breeds that are billed as hypo-allergenic often bring in dust and pollen on their coats, depositing it on your bed for you to breath in during the night. Lastly, you are your biggest enemy when it comes to nighttime allergies. If you suffer from hay fever during pollen season, it is imperative that you clean off those microbes that have attached to your skin and hair before retiring. Not doing so, leaves them on your pillow case and sheets, keeping you from finding relief and getting a good night’s sleep. Wash all bed linens every 10 days or less in hot water of at least 130 degrees Fahrenheit. 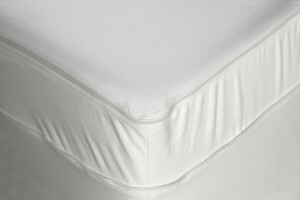 Protect the life of your mattress by encasing in an anti-allergen mattress cover. Maintain household humidity at 30 to 50 percent. Have carpets and rugs cleaned every six months or less. Wash your face, hands and hair during pollen season to reduce the amount of allergens in your bedroom. Experts recommend replacing your mattress every seven to 10 years depending on how often it is used. At Mattress for Less, we can help you get out of that old, worn-out, allergen-laden mattress into one that promises a better night’s sleep. With financing options available to most everyone, we are the most-trusted mattress store in Newington. We welcome you to visit us now at our Berlin Turnpike location. We offer the very best mattress and bedroom furniture brands, including Sealy, Eastman House, Eclipse and Hillsdale. Get Your Next Mattress with No Money Down!